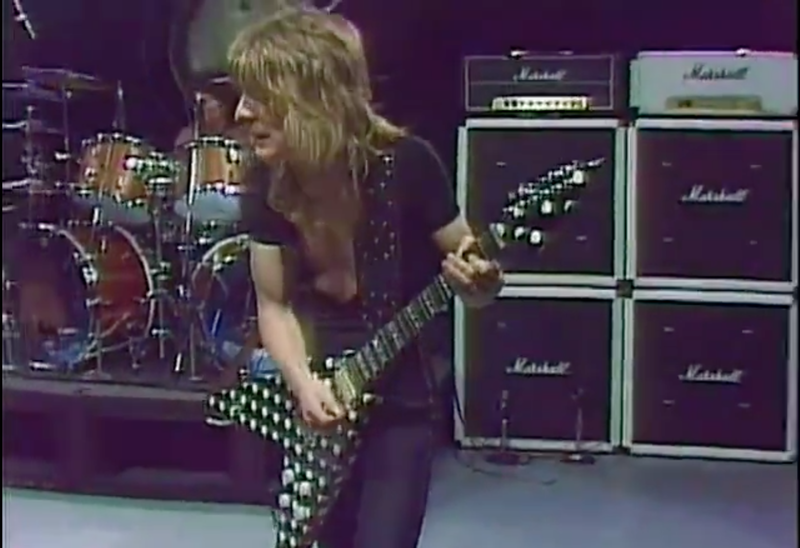 On April 28 1981, Randy Rhoads took to the stage at 31 Studios in Ogden, New York (just outside Rochester) to film a live performance, which would be broadcast on the After Hours TV Show in support of Ozzy Osbourne’s debut solo album, Blizzard of Ozz. In the video clips below, see Randy (armed with his Karl Sandoval “Polka Dot” Flying V and Gibson Les Paul Custom) perform the legendary renditions from that night of, “I Don’t Know”, “Crazy Train”, “Mr. Crowley” and “Suicide Solution” as part of Ozzy’s solo band. The precious footage is arguably the clearest example of Randy in action before his tragic untimely death in March 1982. Just a quick correction- this was NOT shot in Ogden, NY but at the WUHF studios on East Ave. in downtown Rochester as part of the “After Hours show- simulcast in stereo on WCMF. I was a cameraman on this shoot, doing all the hand held and low angle shots. The guys in the band were all great and a pleasure to work with! Hi Mark, as a huge Rhoads fan I am curious if it is true that they rolled through the set of songs twice. Were they both filmed and do you know what happened to the other video of the other versions? Did you get to meet Randy and were/are you a guitar player? Hello SW78 and thank you for your interest. We may have done a couple takes on some of the songs but to be honest it was so long ago I’m not sure. My recollection is we did everything in one take! Pretty amazing these days. In any case- all the original footage before editing is long gone (to the best of my knowledge) and what you see is all there is. A lot of it was “switched live” by the director from the control room so ISO tapes would not have been kept after editing. It was very casual in the studio at the time of the taping with just a handful of people- the band and a small TV crew so we all had time to chat with Ozzy and Randy. Really nice people! Ozzy was very polite and soft spoken and Randy was just really quiet- that is until he let loose on his guitar!. To answer your last question- I’m a Bass player so pounding on a bass with your fists was a revelation for me! The whole night is something I’ll never forget and I’m glad the footage lives on! I was there,all songs were done twice,with short break in between. I sat on floor leaning back on the bleachers at randy s feet. I’ll never forget that night. Randy was very nice,showed me his guitars and explained them to me as his new custom he had built. Hmmm- that’s an interesting “tale” Larry, since I was there as well- as one of cameramen and editors on this shoot. I don’t recall you being there and we didn’t have any “bleachers” in our studio at that time. You couldn’t have been at Randy’s feet without getting in the way of the crew filming him. Would you care to elaborate?